The 2015-2016 marked a controversial season regarding sweeping, equipment, defining fair play and the impact on the spirit of the game. PART TWO – Recreation & Club Play, Bonspiels, Funspiels, etc. Curling Canada played a major role with the World Curling Federation and Canada’s National Research Council in understanding, researching and creating new equipment guidelines to re-establish integrity in a fair playing field. As the world’s largest curling jurisdiction, we are confident that the great Canadians who play this game each and every day will continue to curl within the true spirit of the game we are noted for. While the moratorium does not extend to recreation play, club play or bonspiels that are not part of the Canadian Team Ranking System, and while curling rinks in Canada have autonomy over their own fields of play, we suggest recreation players may use brush heads previously banned or built during the 2015-16 season (or earlier). 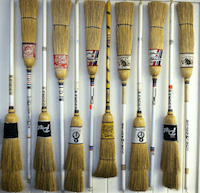 We would also encourage everyone however, to consider the true spirit of the sport of curling, and regardless of the brush head in use, all players should revert to the sweeping techniques / styles in play prior to the 2015-16 season. Most of the ‘unusual’ sweeping methods encountered last season have been dispelled as demonstrated / verified by the results of the Sweeping Summit and the executive summary of the NRC. When using compliant material, the sweeping angle (90 degrees north-to-south 45 degrees) was determined to be irrelevant in affecting the stone other than taking it farther or keeping it straighter. Or more simply put, sweeping east to west does not make a non-compliant brush head compliant. Conclusion: sweep in any direction you want, but do not leave debris in front of the stone and the last brush stroke should be away and to the side of the path of the stone. When using compliant material, having two sweepers on a draw shot will carry a stone further than using one sweeper. Conclusion: return to form from the 2014-15 season with both sweepers brushing on either side or the same side of the delivered stone. When using compliant material, sweeping take-outs with one sweeper to either keep it straight or to make it curl more, had little if any effect. Conclusion: using two sweepers for take-outs is better than one sweeper only. To read the full Moratorium please click HERE. As more information becomes available and equipment continues to evolve, we will continue to evaluate the impact on Club members and support initiatives that align with the best interest of our Club members and the integrity of the game. Questions or concerns can be addressed to the General Manager.